I'm done with NAB2105, and even after all the new camera announcements I have no plans to sell my BlackMagic Design Pocket Cinema Camera. In fact I have a big shoot tomorrow in which i'm taking the BMPCC out. The specs and quality coming out of this little guy still holds up dollar for dollar. Yeah sure BlackMagic Design has announced two new 'Micro Cinema Cameras', but once you dig into the specs it's really quite different than the original Pocket Cinema Camera. Now paying full price might be a stretch, but you're all in luck. Here's a great bundle deal for the BlackMagic Design Pocket Cinema Camera! You get an INSTANT -$500 OFF the retail price of the BMPCC. The bundle includesa Lumix 14-140mm Lens + Sandisk 64GB Extreme Pro SD Card so you can start shooting RAW), and a spare BMPCC Battery. And you can get FREE Expedited shipping on this deal. So if you've ever wanted to shoot a camera that has many flavors of ProRes, and can shoot CinemaDNG RAW now's the time. This is over $500 dollars back in your pocket on this deal. Don't miss this deal, check it out now before it's gone (CLICK HERE). Posted in dslr video. 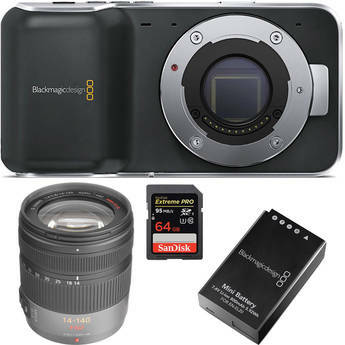 Tags: Crazy DEAL - BlackMagic Pocket Cinema Camera + Lens + Battery + SD Card on April 17, 2015 by Emm. Do you know if anyone is offering as good of a sale as the $500 from last year - for this holiday season (2015)? Would love to hear more detail on what you mean by "but once you dig into the specs it’s really quite different than the original Pocket Cinema Camera". Really? In what way? Because once you dig into the specs it acutally seems like you'd be crazy to buy a pocket unless it was pretty freaken cheap (which this isnt when compared to past discounts and used price). totally agree, unless your uping your budget and going for an URSA Mini, this pocket cam is solid. Despite all the shortcomings it hasn't flipped out on me once, I'm not a heavy user of the cam, but that's my experience. All I hoped for was an ergonomically designer cam body with everything built in and a great battery option. I wish they would drop the camera back down to $500 like they did last year for like 2 days. Yes, it's $1495-$500. Still a great deal.